Savannah State University’s Department of Mass Communications hosted the 62nd annual Southern Regional Press Institute (SRPI) from Feb. 21-22. The twoday mass media conference carried the theme “Politics, the Press and Platforms: The Role of Mass Media in Political Campaigns” and included workshops on radio/television production, marketing, public relations, journalism, graphic design and professional development for high school and college students. The workshops were instructed by more than 40 media professionals and educators, including Kenneth Irby, senior faculty, visual journalism and diversity, the Poynter Institute; Kimberly Starks, manager, media relations, the Georgia Lottery; Susan Catron, executive editor, Savannah Morning News; Dawn Baker, anchor, WTOC-TV; Mark Streeter, editorial cartoonist, Savannah Morning News; Sonny Dixon, anchor, WTOC-TV; Brandi Cummings, anchor, WTOC-TV; Rob Macko, anchor, WJCL-TV; Andrew Davis, anchor, WSAV-TV; Russ Riesinger, anchor and reporter, WSAV-TV; Kim Gusby, anchor and reporter, WSAVTV; Julie Eisenman, news director, WJCL-TV; Jan Smith, news director, WTOC-TV; Annabelle Carr, managing editor, Savannah Magazine and Tanya Milton, Advertising Director of The Savannah Tribune. Tory Dunnan, a correspondent for CNN Newsource’s “RunningMate,” spoke at the opening session. Based in Washington, Dunnan reports from political events, including the first presidential caucus in Iowa and first presidential primary in New Hampshire, CNN-sponsored debates and political conventions. Kenneth Irby was able deliver the keynote address. He challenged the audience to “Get Ready…Go Get It” Novella Cross Holmes was special project coordinator for the 62nd annual SRPI. 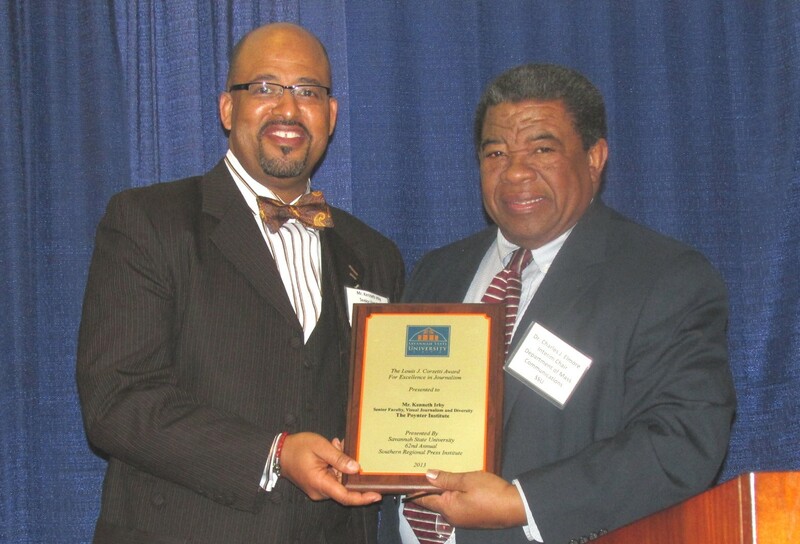 Charles Elmore presents Milledge Owens Award to Kenneth Irby. He accepted the award for Eric Deggans.